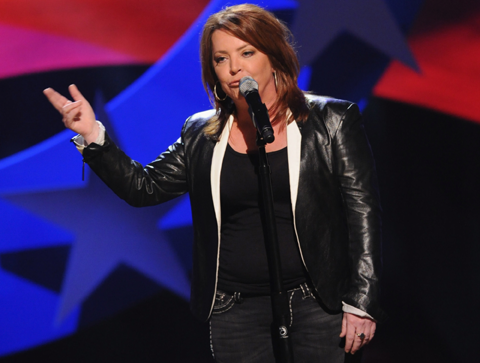 Kathleen Madigan, comedian from Florissant, Missouri will be performing at The Wilbur Theatre at 246 Tremont Street in Boston this Saturday, March 29, 2014 at 7:00 p.m. Working at Comedy Connection and Nick’s in the past Madigan who is from Missouri said she has been coming to the Boston area for a long time. From Missouri, she said I pronounced her states name correctly as some people usually say “Missoura” or “Mississippa” explaining that those names do not have an A on the end of them. Recently performing in Florida, Los Angeles, Providence, Rhode Island and Palm Springs she will be in North Hampton the night before appearing at The Wilbur Theatre on Saturday, March 29, 2014 at 7:00 p.m.
“I’ll get in early enough to find some clam chowder and I know that sounds like a tourist but I don’t care,” said Madigan. “Madigan Again” is the name of her most recent special that came out on NetFlex where the 25-years into the comedy scene year old comic said she likes because it is on whenever someone wants to watch it. “I’ve had specials on HBO and Showtime and people go, ‘When can I see it?’ and I’ll be like ‘I don’t know.’ On NetFlex you can watch it anytime you want. It’s a great way to instantly reach people,”’ said Madigan. The best part of putting a special together in the mind of Kathleen Madigan is the “alcohol after I’m done” but is more of the hype of knowing what city she will be performing in. Stating the fact the jokes are obviously a very important part of the production of her specials, Madigan said she gets excited knowing what city she will perform in. Opening for Madigan will be Comedian Vick Henley who Madigan said is a New York guy from Alabama. The Wilbur Theatre is located at 246 Tremont Street in Boston and for tickets go to http://www.goodseattickets.com/Kathleen-Madigan. For more information about Kathleen go to www.kathleenmadigan.com.